Before I met Annie, I generally preferred my pasta sauces to be red - tomato based. I avoided "alfredo" type white sauces because...actually I really don't have a good explanation of why I don't like white sauces. Anyway, these days Annie usually makes pasta sauces with cream, olive oil, and vermouth, keeping it light so you can actually see all the other ingredients. 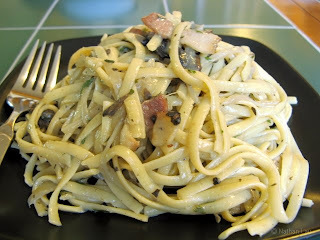 This linguine alla carbonara recipe (based on a recipe out of "Lidia's Italian American Kitchen"), contains bacon, olive oil, onions, chicken stock, linguine, egg yolks, grated Pecorino Romano cheese, and s&p. 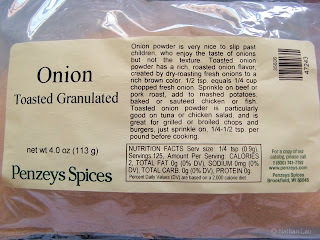 Our additions included portobello mushrooms, thyme, and some toasted onion powder from Penzey's. Oh, it was sooooo good. Made even better by that special onion powder. If you can get your hands on some, I do recommend it.